WEB Summit organisers have strongly defended their handling of the food element of the event, the cost of which has become a talking point during this week’s event in Dublin. The event is using a system of food vouchers or tokens that are purchased by attendees that can be used at Food Summit, where Irish produce is sold. They range in price from €20 for a meal and a discounted €50 for three vouchers if you are attending for three days. Attendees have complained about the price given that food had already been priced into tickets at previous web summits - with a burger and chips and a bottle of water for €20 provoking considerable ire on social media. However, organisers say that they are making a loss of €10 per meal on food sold at the event this year. “When costs of the Food Summit are taken into consideration, including venue rental, insurance, marquee build, electrics, staffing, security and services, Web Summit makes a loss of approximately €10 per meal sold,” said Mike Harvey, head of communications for the Web Summit. In addition, co-founder Paddy Cosgrave has been vocal in the past about Dublin restaurants and hotels hiking up their prices as thousands of visitors descended on the city for duration of the event. Ms Murphy told Independent.ie: “For us, having taken an overview of everything, it is good value for what you get. “Food has been brought in from the four quarters of Ireland – from Donegal to Cork. 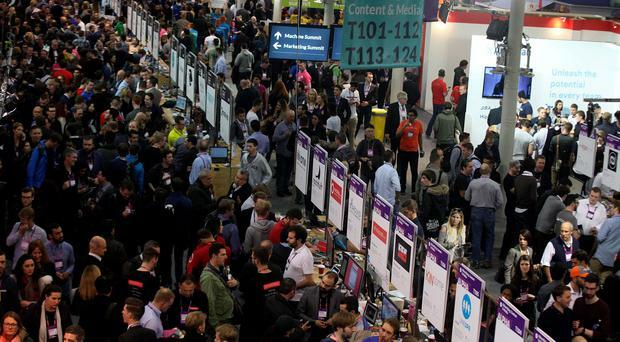 “(The event) is not just about the food.......there are also associated costs... It’s about trying to find an equitable solution for everyone,” said the Cork native, who has been heading up Web Summit live events since 2013. Aside from the food issues, the event has been criticised in the past for the quality of its wifi network although the services this year were beefed up. This is the Web Summit’s last year in Dublin for the foreseeable future – it is moving to Lisbon next year for three years where the Portuguese Government has agreed to pay €1.3m to the Summit to host it over the three years. In a number of recent rants, the most recent last morning, Mr Cograve has been largely blaming a lack of support from Government for its decision to move from Ireland. However, he has also conceded that the Summit has grown too big for Dublin. The Web Summit today launched a new initiative designed to address the shortage of women in technology. It is inviting 10,000 women entrepreneurs to its international events in 2016 - Web Summit, SURGE, Collision and RISE – for free. Business people and entrepreneurs have been asked to nominate "incredible female entrepreneurs" to receive an immediate free ticket, sent to their email. Those nominating can choose between the four gatherings for their nominee. “We’ve been producing conferences all over world, it’s pretty obvious there’s a large deficit,” said Ms Murphy. “It’s actually a good ratio in our offices – we have female data scientists and engineers. However, she added it is a grass roots problem with not enough female school children taking up the so-called ‘stem’ subjects like maths and engineering.